University of Kansas, B.S., 1981. California Institute of Technology, Ph.D., 1987. University of California, Berkeley, IBM Postdoctoral Research Fellow, 1987-1989. University of Pennsylvania, Assistant Professor, 1989-1994; Associate Professor, 1994-1996. University of Utah, Distinguished Professor, 1997-2010. 2019 Joel Henry Hildebrand Award in the Theoretical and Experimental Chemistry of Liquids, American Chemical Society National Award. 2013 American Chemical Society Division of Physical Chemistry Award in Theoretical Chemistry. 2013 Elected to the International Academy of Quantum Molecular Science. 2012 Elected Fellow of the Biophysical Society. 2009 Elected Fellow of the American Chemical Society, Inaugural Class. 2008 University of Utah Distinguished Scholarly and Creative Research Award. 2008 Keynote Speaker, Science2008, University of Pittsburgh. 2008 Palke Lecturer, University of California, Santa Barbara. 2005 Elected Distinguished Professor, University of Utah. 2004-05 John Simon Guggenheim Memorial Fellowship. 2003 Miller Visiting Professorship, University of California, Berkeley. 1998-2002 National Science Foundation Creativity Award. 2000 University of Utah Faculty Fellow Award. 1999 Reilly Lecturer, University of Notre Dame. 1999 Frontiers of Chemistry Lecturer, Wayne State University. 1999 Elected Fellow of the American Association for the Advancement of Science. 1997 Elected Fellow of the American Physical Society. 1997-99, 2003-05 IBM Corporation Faculty Research Award. 1994-99 Camille Dreyfus Teacher-Scholar Award. 1992-94 Alfred P. Sloan Foundation Research Fellow. 1991-96 National Science Foundation Presidential Young Investigator Award. 1990-95 David and Lucile Packard Foundation Fellowship in Science and Engineering. 1990-91 Lilly Foundation Teaching Fellowship. 1989 Camille and Henry Dreyfus Distinguished New Faculty Award. 1987 The Francis and Milton Clauser Doctoral Prize, California Institute of Technology. 1986 The Herbert Newby McCoy Award, California Institute of Technology. 1985 The Procter and Gamble Award for Outstanding Research in Physical Chemistry, American Chemical Society. J. F. Dama, M. Parrinello, and G. A. Voth, “Well-tempered Metadynamics Converges Asymptotically”, Phys. Rev. Lett. 112, 240602(1-6) (2014). 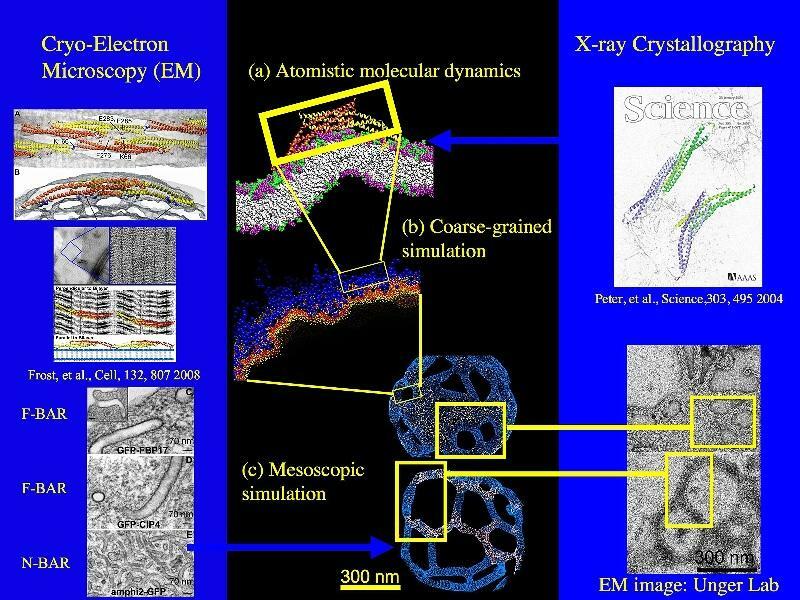 R. Liang, H. Li, J. M. J. Swanson, and G. A. Voth, “Multiscale Simulation Reveals a Multifaceted Mechanism of Proton Permeation through the Influenza A M2 Proton Channel”, Proc. Nat. Acad. Sci. USA 111, 9396–9401 (2014). Z. Cao, R. Kumar, Y. Peng,and G. A. Voth, “Proton Transport Under External Applied Voltage”, J. Phys. Chem. B (2014) Online: DOI: 10.1021/jp501130m. S. Jang, A. V. Sinitskiy, and G. A. Voth, “Can the Ring Polymer Molecular Dynamics Method be Interpreted as Real Time Quantum Dynamics?”, J. Chem. Phys. 140, 154103(1-11) (2014). M. G. Saunders, J. Tempkin, J. Weare, A. R. Dinner, B. Roux, and G. A. Voth “Nucleotide Regulation of the Structure and Dynamics of G-actin”, Biophys. J. 106, 1710–1720 (2014). B. P. Ziemba, J. Li, K. E. Landgraf, J. D. Knight, G. A. Voth, and J. J. Falke, “Single Molecule Studies Reveal a Hidden Key Step in the Activation Mechanism of Membrane-Bound Protein Kinase C alpha”, Biochemistry 53, 1697-1713 (2014). Y.-L. S. Tse, H. N. Sarode, G. E. Lindberg,T. A. Witten,A. M. Herring, and G. A. Voth, “Chloride Enhances Fluoride Mobility in Anion Exchange Membrane/Polycationic Systems”, J. Phys. Chem. C 118, 845–853 (2014). R. Liang, J. M. J. Swanson, and G. A. Voth, “Benchmark Study of the SCC-DFTB Approach for a Biomolecular Proton Channel”, J. Chem. Theor. Comp. 10, 451–462 (2014). C. J. Bruns, J. Li, M. Frasconi, S. T. Schneebeli, J. Iehl, H.-P. Jacquot de Rouville, S. I. Stupp, G. A. Voth, J. F. Stoddart, “An Electrochemically and Thermally Switchable Donor-Acceptor [c2]Daisy Chain Rotaxane”, Angewandte Chemie (Int. Ed.) 53, 1953-1958 (2014).J. M. A. Grime and G. A. Voth, “Highly Scalable and Memory Efficient Ultra-coarse-grained Molecular Dynamics Simulations”, J. Chem. Theor. Comp. 10, 423–431 (2014). J. M. A. Grime and G. A. Voth, “Highly Scalable and Memory Efficient Ultra-coarse-grained Molecular Dynamics Simulations”, J. Chem. Theor. Comp. 10, 423–431 (2014). M. Simunovic, A. Srivastava, and G. A. Voth, “Linear Aggregation of Proteins on the Membrane: A Prelude to Membrane Remodeling”, Proc. Nat. Acad. Sci. USA 110, 20396–20401 (2013). R. Kumar, C. Knight, and G. A. Voth, “Exploring the Behavior of the Hydrated Excess Proton at Hydrophobic Interfaces”, Faraday Discussion 167, 263-278 (2013). J. Xu. T. Yamashita, N. Agmon, and G. A. Voth, “On the Origin of Proton Mobility Suppression in Aqueous Solutions of Amphiphiles”, J. Phys. Chem. B 117, 15426–15435 (2013). J. Li, O. Sode, G. A. Voth and S. Hirata, “A Solid-Solid Phase Transition in Carbon Dioxide at High Pressures and Intermediate Temperatures”, Nature Communications 4, 2647(1-7) (2013). J. L. Baker and G. A. Voth, “Effects of ATP and Actin-Filament Binding on the Dynamics of the Myosin II S1 Domain”, Biophys. J. 105, 1624-1634 (2013). A. W. Lange and G. A. Voth, “A Multi-state Approach to Chemical Reactivity in Fragment Based Quantum Chemistry Calculations”, J. Chem. Theor. Comp. 9, 4018-4025 (2013). Y. Chen, J. Aardema, S. Kale, Z. L. Whichard, A. Awomolo, E. Blanchard, B. Chang, D. R. Myers, L. Ju, R. Tran, D. Reece, H. Christensen, S. Boukour, N. Debili, T. S. Strom, D. Rawlings, F. X. Vázquez, G. A. Voth, C. Zhu, W. H. A. Kahr, W. A. Lam, and S. J. Corey,“Loss of the F-BAR Protein CIP4 Reduces Platelet Production by Impairing Membrane-Cytoskeleton Remodeling”, Blood 122, 1695-1706 (2013). C. L. Phillips and G. A. Voth, “Discovering Crystals Using Shape Matching and Machine Learning”, Soft Matter 9, 8552–8568 (2013). A. V. Sinitskiy and G. A. Voth, “Coarse-graining of Proteins Based on Elastic Network Models”, Chem. Phys. 422, 165–174 (2013). Multiscale Theory and Simulation: The Voth group has a key focus on the development of powerful multiscale theory and computational methods for complex biomolecular systems. 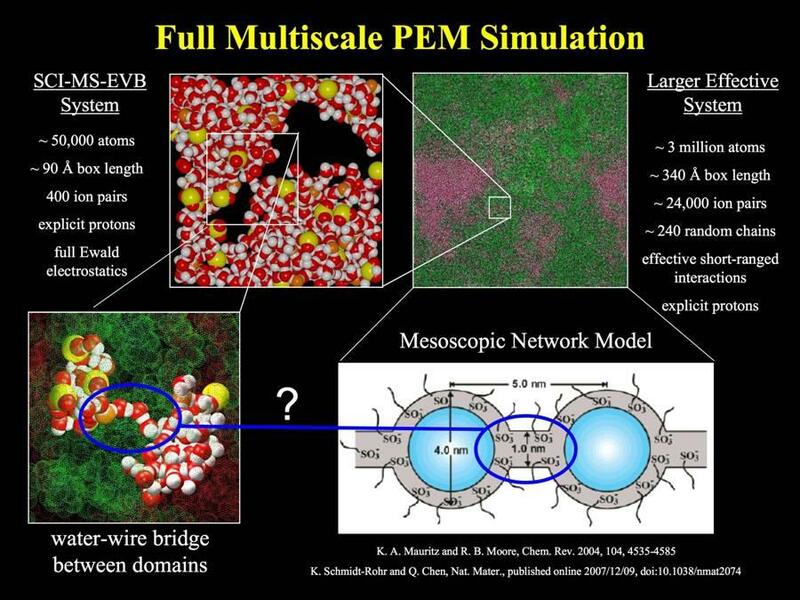 These multiscale methods include systematic coarse-graining approaches, mesoscopic modeling, and multiscale bridging between all of the relevant scales. Our multiscale methods are being applied to filaments (such as actin, shown in Fig. 1), microtubules, biological membranes and membrane proteins, nucleic acids, peptide aggregation and self-assembly, carbohydrates, and viral capsids. Charge Transport: The transport of charge (protons and electrons) in aqueous and biomolecular systems is another important multiscale phenomenon. Here, the smallest scale is at the scale of the electrons because such processes involve either the electrons directly or indirectly, often in the form of proton transport (via, for example, the Grotthuss hopping mechanism in which chemical bonds and hydrogen bonds are rearranged to translocate the excess protonic charge along the water chain). Proton transport is also dependent on the conformation, dynamics, and assembly of the medium in which it occurs. Our group has worked for nearly twenty years to develop a multiscale theoretical and computational methodology to describe proton transport phenomena in biology and in a host of other systems. Schematically depicted in Fig. 3 below is the range of the systems we have studied, in this case relevant to biological proton solvation and transport processes occurring in the cell. This includes excess protons in bulk water and related systems (panel A), at phospholipid membrane interfaces (panel B), in proton pumps such as cytochrome c oxidase (panel C), through proteins such as the M2 proton channel of the influenza A virus (panel D), in other channels such as mutated aquaporins (panel E), in Na+/H+ and Cl-/H+ antiporters, and in the enzyme human carbonic anhydrase and its mutants (panel F). In the future, proton and electron transport in a number of other important biomolecular systems will also be studied, and this description of fundamental charge transport phenomena will be incorporated into our overall multiscale computer simulations in order to reach very large length and time scales, and enzymes such as carbonic anhydrase. 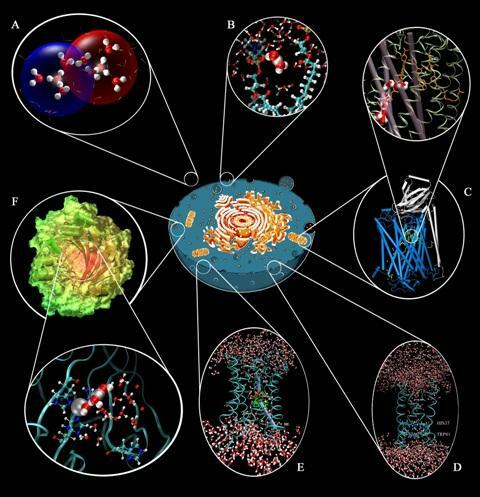 A critical aspect of the computational approach of these problems is the ability to include the explicit process of proton shuttling through chains of water molecules and protein amino acids. Complex Materials Relevant to Renewable Energy Technology: This work in the Voth group includes theoretical and computational studies of solvation phenomena and complex dynamics in novel room temperature ionic liquids and ion exchange membranes, such as proton exchange membranes (PEMs) for fuel cell applications (see Fig. 4 below).